Peritoneal assisted ventilation in a severely head injured patient by use of Perfluorocarbons PFC. Severe head injured patients are usually associated with low GCS score. Many neurosurgical centers in the world use to put patient with CGS < 7 on controlled mechanical ventilation for better management of brain edema by securing optimal blood oxygenation and carbon dioxide CO2 level or to hyperventilate the patient. Isolated head injury or multiple injury are in some percent of the cases are associated with respiratory distress syndrome RDS or a direct lung trauma as part of multiple injury. The later lung status makes the lung as first line to normal oxygenation is out of order however a high mechanical pressure and oxygen concentration are used. Peritoneum was a very good friend in many conditions like a role in renal failure dialysis and some instances of blood transfusion. So due to such peritoneal cavity properties the use non-irritant solution which is in the same time has an oxygen-carbon dioxide exchange capacity to aid or replace the impaired lung to oxygenate the blood and in the same time get rid of CO2 . This inert solution is the perfluorocarbones PFC that sometimes was used to use as a blood substituent which can be transfused into the blood vessels to replace lost volume of blood with is magic capacity to take the role of hemoglobin. Lung impairment or insufficiency for blood gases exchange in multiple injured patients or an isolated head injury is not uncommon. So a lung contusion in a certain percentage due to a direct blunt chest trauma, fill of alveoli with solutions like the water of drowning or an inhaled vomitus during the head injury especially in mal-positioning (or in epilepsy) or inhaled blood, cases of neurosurgical or Cushing’s pulmonary edema severe enough to cause impaired gases exchange and hence low blood oxygenation. If the alveoli are full of anything but no air pressure mechanical with 100% oxygen will not solve the problem as the exchange surface area decreased. From that another route should be available and it is the peritoneal cavity no reference or text book mentioned this idea of application, all sources talked about the blood substitution as an intravascular route not through peritoneal cavity. When I was a resident in neurosurgery and read in our recommended text book  at that time 1994 the chapter of blood substitution material with which the author meant to use this material for blood donation in patients who need a lot of whole blood units for any cause. When I went on this chapter and read about this material specificities an idea spring to my mind to use this inert substance as that of peritoneal dialysis in renal failure. The Perfluorocarbon PFC solution was known as an artificial blood. Was used to substitutes the original blood in case of blood donation problems like whom based on religion bases who reject natural blood donation [2-4]. But this artificial blood use was stop due to application due to a very simple difficulty which is the thawing of its component where use eggs albumin . This solution is an inert since not irritates the endothelium of the blood vessels and FDA proved  so by logic not irritates the peritoneal lining. It carries O2 and CO2 as that of hemoglobin. The rate of administration into the peritoneal cavity is what determines it could be a complete or partial lung substituent. It act as extracorporeal heart-lung machine. In a technique similar to peritoneal dialysis. And similar to the heart-lung machine for PFC oxygenation. What is left is the way and rate of administration into the peritoneal cavity . Here we need some practical data. As I lack the suitable applied sciences research platform so we need some center who can apply such project to plot the data from a pilot studies. It is an ICU bedside measure that bring normal PaO2 to the brain which is the one of three real bridge stones in head injured management even the score of injury is moderate but when associated with low PaO2 due to some lung problem this moderate score will become worse due to this low PaO2 . As it is of a similar logic of peritoneal dialysis and heart-lung machine this makes things also safe and productive in the line of the aim which is to assist the lung to normalize PaO2 . Reference 1, made the trigger for such project in my mind since early nineties, now by simple review to the Wikipedia one can know all what about this story with recent updating and references, that means I will no more bother myself to clarify more because whom are interested no need to be stressed on, just I say something about the Oxygen and as a result the Carbon dioxide carrying capacity. 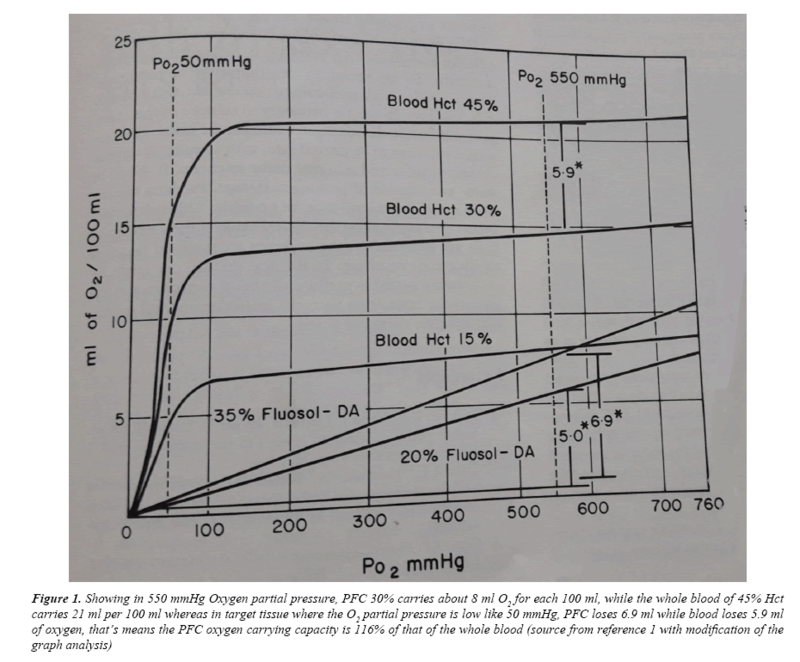 In 550 mmHg oxygen partial pressure (Figure 1), PFC 30% carries about 8 ml O2 for each 100 ml. while the whole blood of 45% Hct carries 21 ml per 100 ml whereas in target tissue where the O2 partial pressure is low like 50 mmHg, PFC loses 6.9 ml while blood loses 5.9 ml of Oxygen, that’s means the PFC Oxygen carrying capacity is 116% of that of the whole blood . The side effects are mentioned are minimal and was stopped not due to side effects, it was stopped due to slight pre-giving preparation as one component thawing which contains white of egg as an albumin which is stored frozen, this minimal side effects when we know that this material which is PFC will stay in blood stream until lung and reticuloendothelial system git rid of it for long time which give some weakness to the immune system (side effects) . While in this new project this PFC will stay very short in peritoneal cavity and withdrawn according to a manner which will be adjusted according to animal studies so if the side effects are minimal in stay of PFC in blood for long it (side effects) will be negligible in this way. As the PFC are inert and can be withdrawn from the peritoneal cavity as any other peritoneal dialysis solutions with the practical Oxygen carrying capacity and relatively safe and simple procedure of use or application and it may be extendedly be used in RCU in addition to what mentioned above for cases of severe pneumonia where a large lobes affected and in extensive asthma where both of these medical conditions bring to a severe pulmonary exchange area diminutions, making the use of this PFC in the peritoneal cavity a supportive and aiding tool for patients on mechanical ventilators if not a total but transient alternative to the affected lung . The number of references given below and many others here, all talk and deal with PFC of blood substitution with minimal side effects [13-17]. No single reference as a literature or a standard textbook refers to use of PFC as a transient peritoneal cavity lavage to make O2/CO2 exchange with the aim mentioned in this article, for that this is a call for a need for such material or any similar for the above mentioned aims making the factors for which this PFC had been withdrawn from routine use are easy in the face of the great help for the critically ill patient in ICU or RCU or the who are suffering from a decrease in a functional alveolar surface area. Wilkins RH, Rengachary SS. Neurosurgery (1st edn). McGraw-Hill, New York. 1985. Chen JY, Scerbo M, Kramer G. A review of blood substitutes: Examining the history, clinical trial results, and ethics of hemoglobin-based oxygen carriers. Clinics (Sao Paulo). 2009;64(8):803-813. Washington HA. Liquid assets, lethal risks. Deadly Monopolies. Knopf Doubleday Publishing Group. 2011. Moore EE, Moore FA, Fabian TC, et al. Human polymerized hemoglobin for the treatment of hemorrhagic shock when blood is unavailable: The USA multicenter trial. J Am Coll Surg. 2009;1:1-13. Winslow, Robert M. Blood substitutes. Academic Press, US. 2006. Marieb, Elaine N. Human anatomy & physiology (4th edn). Addison Wesley Longman, Inc., Menlo Park, California. 1998;650. Garrelts JC. Fluosol: An oxygen-delivery fluid for use in percutaneous transluminal coronary angioplasty. DICP : the annals of pharmacotherapy. 1990;24(11):1105-12. Bruno S, Ronda L, Faggiano S, et al. Oxygen delivery via allosteric effectors of hemoglobin and blood substitutes. Burger's Medicinal Chemistry and Drug Discovery. 2010. Wall TC, Califf RM, Blankenship J, et al. Intravenous Fluosol in the treatment of acute myocardial infarction. Results of the thrombolysis and angioplasty in myocardial infarction 9 trial. TAMI 9 Research Group. Circulation. 1994;90(1):114-120. Vorob’ev SI. First- and second-generation perfluorocarbon emulsions. Pharm Chem J. 2009;43(4):209–218. Cohn CS, Cushing MM. Oxygen therapeutics: Perfluorocarbons and blood substitute safety. Crit Care Clin. 2009;25(2):399–414. Kramer GC, Brauer KI, Funston JS, et al. Oxygen-carrying plasma expanders: A new class of fluids for perioperative support. Perioperative Fluid Therapy. CRC Press, US. 2006;175–186. Keipert PE. Use of oxyget, a perfluorochemical-based oxygen carrier, as an alternative to intraoperative blood transfusion. Artif Cells Blood Substit Immobil Biotechnol. 1995;23(3):381–394. Niiler E. Setbacks for blood substitute companies. Nature Biotechnology. 2002;20(10):962–963. Winslow RM. Current status of oxygen carriers ('blood substitutes'): 2006. Vox Sang. 2006;91(2):102–110.